Size: 16" x 24" x 5"
This bag has been constructed using time tested design that balances economical cost and construction with high functionality. The result is a fantastic bag that won't break the bank. Triple layered interior foam is covered in high quality leather. Handles have been placed on the rear and top of the bag for safe holding. The light curvature helps funnel strikes into the safe sweet spot. Perfect for light and medium contact. Email your friend about the Revgear Classic Striking Shield. 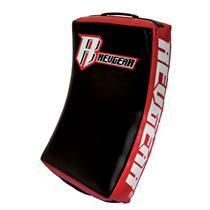 Ask a question about the Revgear Classic Striking Shield.